Organizations don’t have time to waste moving between multiple tools and platforms to get their jobs done. Creators need to realize their vision in as few steps as possible. Increasingly, organizations need to collaborate on omni-channel content including large video files, often across geographies. From storage, hardware transcoders to render farms and cloud-based tools, companies struggle to integrate an ever-growing number of hardware and software systems. with a work-in-progress Media Asset Management system (MAM). Zoom talks to any hardware transcoders, archive systems, third party APIs and more that your company uses and keeps them working in concert seamlessly. Multiple offices can remain in sync through Zoom Non-Stop, and true remote workflows can be fully achieved using Zoom’s de-duplication, proxy management and web portals. Evolphin Zoom is the backbone for the modern creative process. Zoom’s open design means that it is hardware agnostic and able to talk with any API. Additionally, Zoom is a complete software solution allowing users to ‘make things happen’ without having to worry about the underlying infrastructure that supports them. and share media assets without leaving their Adobe application. Comments from collaborators are pushed right back to the Adobe application in a twitter-like feed, saving time and effort. A leading sports broadcaster based in Miami and New York City using Adobe Photoshop and Adobe After Effects relies on Evolphin Zoom for its asset management workflows. Since introducing Zoom, they’ve seen a 35% decrease in storage growth and a 28% increase in content production. Over 60M files have been cleaned of duplicates and old content, with automatic storage tiering and archive enabling an effortless back-end under one unified repository of assets. 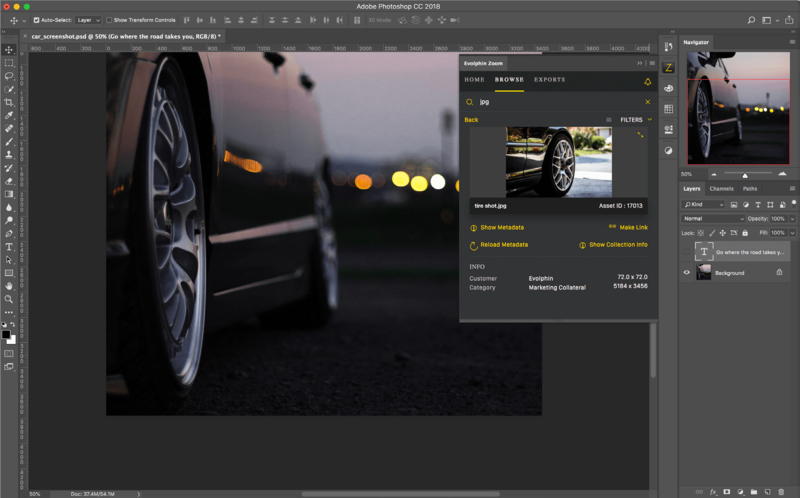 The world’s oldest automobile giant uses Adobe Photoshop, Adobe Illustrator, and Adobe InDesign in combination with Evolphin Zoom to keep multiple databases and creatives synced across continents. They’ve experienced a 60% faster turnaround time on projects, an 80% error reduction rate per annum, and a 40% faster review cycle since rolling out Evolphin Zoom. They now enjoy 99.999% up-time availability thanks to Evolphin’s revolutionary Zoom Non-Stop database sync product. One of the world’s most influential New York City based media companies uses Evolphin Zoom in their Adobe Premiere Pro and Adobe After Effects video production pipelines. Zoom enables them to have a 30-40% faster turnaround time for daily video production, a 25% total increase in video production quantity after deploying Zoom, a 40% decrease of overall storage growth, and a greater insight into team projects and productivity through Zoom Analytics. 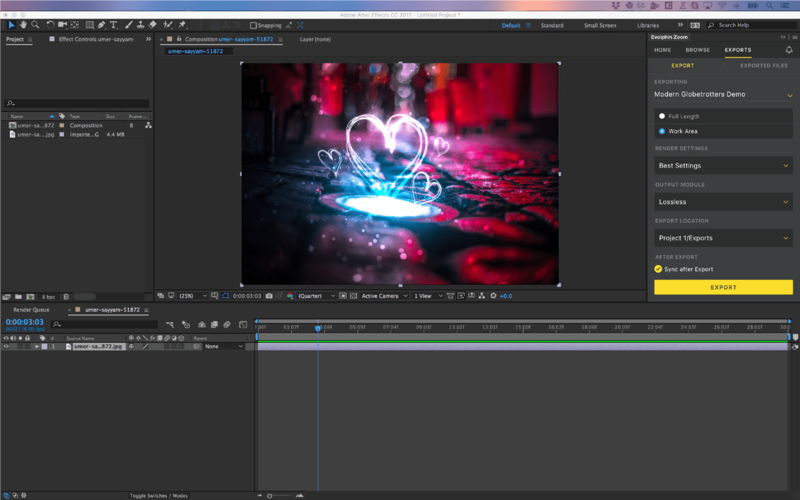 Below are just some of the capabilities Evolphin Zoom brings to the creative process. 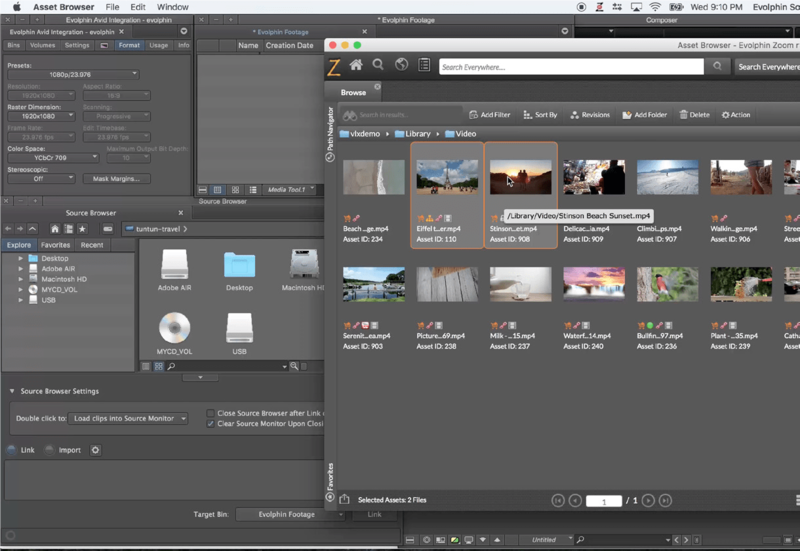 The Evolphin Zoom plugins allow users to easily search for and retrieve any asset in their Zoom MAM database and storage systems, right from within each Adobe app. Files can be dragged and dropped into projects and immediately worked with. 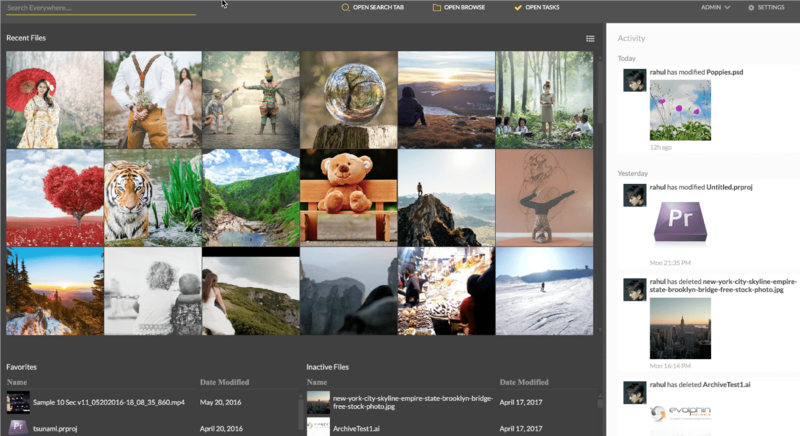 In the Zoom Asset Browser, users can see a list of all media used in any project without having to open the file, and can see all projects that use a single media asset. In addition to tracking all assets used in projects, Evolphin Zoom can monitor and track licensing dates and other requirements for your content. Media past its license date can be labeled as expired and prevented from being used. Zoom can monitor and keep track of every location media is published, so your company proactively avoids costly copyright and licensing issues. 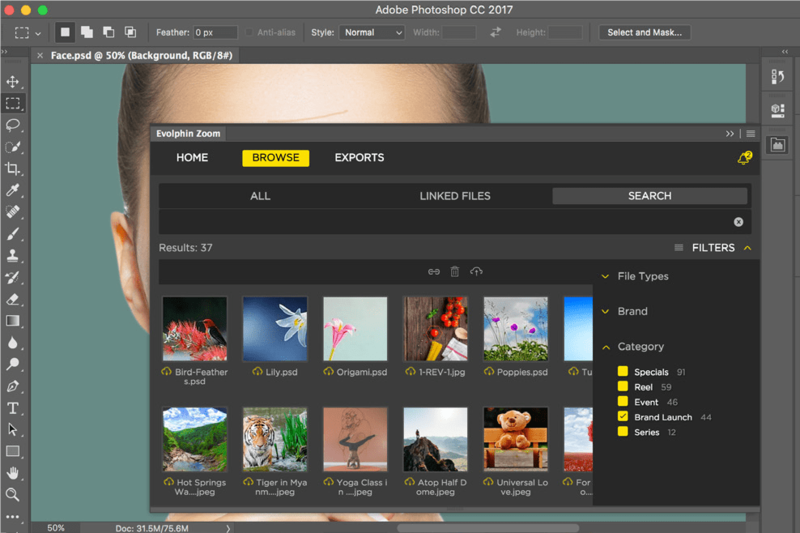 Evolphin’s Adobe plugins allow users to swap between low-res, mezzanine, and high-res versions of each file with the click of a button. The ability to easily create, share, and edit with low-res proxies is what enables companies to collaborate on video content across geographies via the cloud or an on-premises MAM. If you need to edit remotely while not connected to your company’s network storage, simply check out the low-res proxies from the MAM and edit away. The same process can be applied to non-video content. Local working copies are automatically re-synced to the MAM when connected to the server which itself may be onpremises or in the cloud. Coupled with Evolphin Zoom’s mobile-optimized web-based review and approval tool, secure collaboration is no longer required to be on-premises. If your team is looking to join an Avid workflow with an Adobe workflow, Evolphin Zoom can bridge the gap so there’s no creativity downtime. 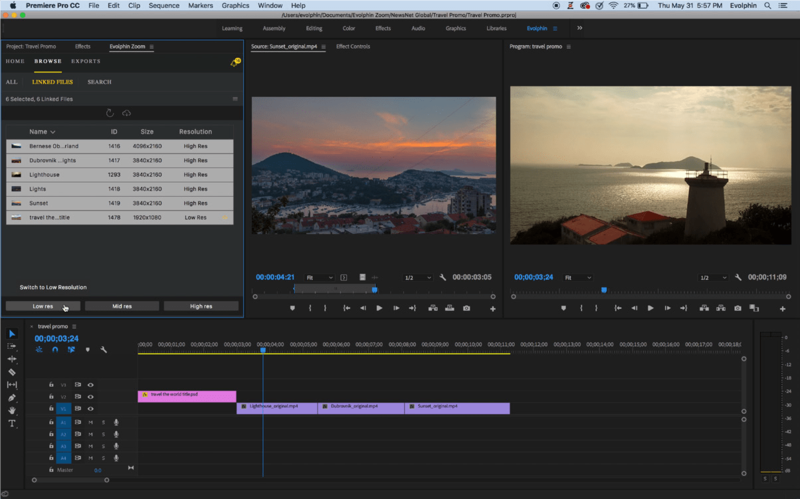 Evolphin Zoom seamlessly connects Avid Media Composer and Interplay to all Adobe Creative Cloud apps, allowing your team to share media and exports between environments easily.